Insect Art: "Slimy, yet Satisfying"? Here is the first thing I will share with you regarding Entomophagy, or, the eating of insects (by humans). I'm not saying I have ever or will ever eat an insect, but when you think about it, they are a perfect source of protein that could solve the world's hunger problems while being kind to the environment at the same time. For example, anyone can farm bugs. It doesn't take a lot of land or resources; bugs aren't hard or expensive to feed. They don't require veterinary care, and they reproduce in vast quantities. If your insect farm is wiped out, you won't loose everything; new stock is cheap and easy to acquire. Even the processing is easy; it would be so much easier to "slaughter" a caterpillar than a cow. Most people could probably handle that, so farming your own protein would be easy to do, from start to finish. 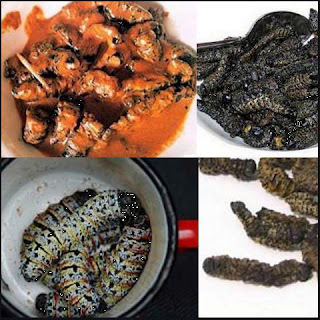 With that little seed planted in your head, check out this interesting article about a South African delicacy, the "Mopani Worm" (actually not a worm, but a moth caterpillar). It is said to be the most consumed insect in the world. Hey, I've eaten bugs! Ants and little salty worms. They're not bad! And since most people eat shrimp with no qualms, I don't know why other creepy crawlies give folks the jeebies. It's purely cultural, no rhyme or reason to it at all. Ans are peppery! But rather hard to collect in large bunches. I would love to see food-farmed insects take off!